Hello there. 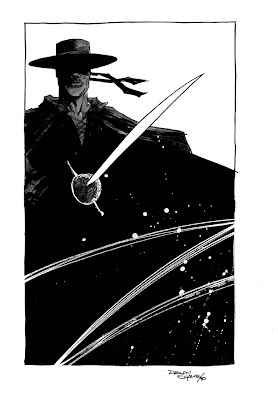 When Zorro was suggested, this little layout popped into my head. I've said it many times; "A good composition makes up for shoddy drawing". For me, at least. I was liking it 'til i saw all the below (and more impressive) pieces go online today, so to make up for it i just whipped up another little doodle. Which i think i much prefer actually. The composition of the first one *is* lovely, Dec - dig the slashed-in Z. The second sketch is frigging adorable. These are great. The blog is great. That border break with the slash was a nice touch. The mini-zorro is adorable with the potential for deadliness. I'll be paying attention to this blog, for sure. Great work everybody. Very cool slashed panel Z, really nice. the Z, why didn't i think of the Z? awesome! I dig this, man! I agree with the Z element. Very sweet! Love the dot eyes on lil' Zorro. Makes him look nervous. Very punchy! Very graphic! Very cool! Ah thanks folks. Yeah, i'm surprised no one else went with the Z thing. The border break is prob the most interesting about the top one. Laura; the drawing itself is also conveniently pocket-sized. Thompson; if only i was able to make an animated gif thing of 'Lil Zorro with his eyes shifting from side to side. *Then* he's look proper nervous. They are both sweet. There's something about the Zorro standing "ready" that really clicks. 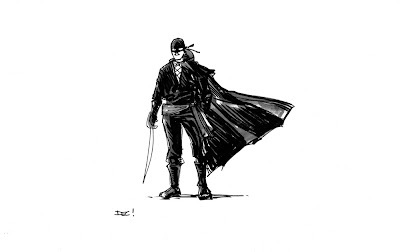 The second Zorro looks like something you'd put at the top of the letter column in the back of the book, which is great. The shadows and textures in that first one are top notch. There is something so completely wonderful about that 2nd Zorro. I think Evan hit it right on the head with a place for it. Awesome Awesome texture as always, Dec! I'm a total sucker for tiny figure drawing, so that second is my fave. Nice!